Prime Minister Sheikh Hasina on Friday expressed her firm conviction that no evil force would be able to destroy Bengali culture and language in future as the people of Bangladesh turned around to live as a dignified nation. The premier made this observation while addressing a discussion organised by Bangladesh Awami League marking Amar Ekushey and International Mother Language Day at Krishibid Institute Bangladesh (KIB) in the capital. “Everything we have earned through struggle and all post-1975 rulers like Pakistani juntas made their vicious attempts to destroy the Bengali culture and language, but failed. In future none would be able to suppress Bengali people”, Sheikh Hasina said. Sheikh Hasina also the president of Awami League (AL), said her party with full confidence of the people came to power for third consecutive term. “We have to work for upholding the confidence of the people through continuing the pace of development and taking forward the country,” she vowed. Bangladesh would be a hunger and poverty free country as dreamt by the Father of the Nation; she said adding that no evil design could be able to distract Awami League from its cherished goal. AL chief Sheikh Hasina presided over the meeting while general secretary Obaidul Quader gave welcome address. Awami League advisory council members Amir Hossain Amu and Tofail Ahmed, presidium members Matia Chowdhury and Sheikh Fazlul Karim Selim, noted litterateur Ekushey Award winner Imdadul Haque Milon, AL Joint Secretary Jahangir Kabir Nanak and Abdur Rahman, addressed the meeting, among others. Publicity Secretary of the party Dr Hasan Mahmud and Deputy Publicity Secretary Aminul Islam conducted the meeting. Awami League central Committee member Akhteruzzaman, president and general secretary of Dhaka North Chapter Awami League AKM Rahmatullah and Sadek Khan respectively, and AL central committee member Merina Khan Kabita also spoke on the occasion. At the beginning, one-minute silence was observed in memory of the martyrs of the Language Movement, Father of the Nation Bangabandhu Sheikh Mujibur Rahman, martyrs of August 15, 1975, Liberation War heroes and the persons died in tragic fire incident in city’s Chakbazar area Wednesday’s night. Sheikh Hasina said Bengali people celebrated Bengali Millennium year 1400 Sal defying barricade of police during Khaleda Zia’s regime. The government of Khaleda Zia could not obstruct people from celebrating and welcoming Bengali year 1400 as people in millions entered into Suharawardy Uddyan breaking police barricade, she said. The prime minister said Awami League launched the journey towards development after coming to power in 2009. During the period from 2013 to 2015 BNP and their cohorts unleased a reign of terror in the name of movement to foil general elections. But, people elected Awami League to power, she added. Sheikh Hasina said country’s development is visible as the Awami League government carried out massive works over the last ten years. Now Bangladesh is considered as a dignified nation in the world, she said. The prime minister said Bangladesh is now free from hunger. But the country needs to be freed from poverty further, she said. Bangladesh would celebrate birth centenary of Bangabandhu in 2020 and golden jubilee of independence in 2021 as a poverty free nation. In 2041 Bangladesh would emerge as a developed and prosperous nation in South Asia and proceed with a 100-year Delta Plan to ensure sustainable development of the country and prosperous future of the people. At the beginning of her speech the Prime Minister expressed her profound shock at the loss of lives in a devastating fire in the city on Wednesday night. She prayed for eternal peace of the departed soul and conveyed sympathy to the bereaved family members. The prime minister said mother tongue is a birth-right of a human being. But, unfortunately the rulers of Pakistan aiming at exploiting the nation, hit the language of Bengalis who were in the forefront to create Pakistan, she said. Focusing on the history of the Language Movement, Sheikh Hasina said although the 21st February in 1952 witnessed the tragic incident, the movement for mother language began much earlier. She said Bangabandhu was sent to jail time and gain for his role in the language movement. Bangabandhu was kept behind the bar at a stretch from 1949 to 1952, she said. At the proposal of Bangabandhu, she said, the State Language Action Council was formed comprising Chhatra League, Tamuddin Majlish and other student organizations in 1948. This Action Council had called for a general strike on 11th March in 1948 across the country. On that day, Bangabandhu was arrested while he was picketing in front of the Secretariat, she said. “In the subsequent days, Bangabandhu was at the center of all movements and struggles. For his involvement Bangabandhu had to endure huge torture and persecution of the rulers,” Sheikh Hasina said. Sheikh Hasina said it was the Awami League which included the provision of making Bangla as a state language after its win in the general election in 1956. The Awami League government had declared 21 February as the Language Martyrs Day and allocated fund form construction of Shahid Minar, she said. 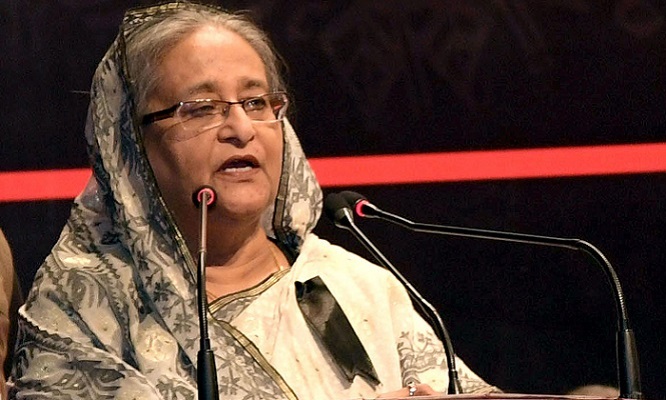 The Prime Minister said, Bangladesh, as the hub of language movement has shouldered a great responsibility to protect the languages now on the verge of extinction. International Mother Language Institute has been constituted for research and give support to protect the languages of different ethnicities and small groups, she said. About the current political situation, the Prime Minister said a vested section feels sick when people of Bangladesh live in peace and become economically sound. They want to play duck and drake with the fate of the people of Bangladesh, she added.